“Restoring youthful energy and hormone balance since 2002” is a track record that cannot be scoffed at. For 12 years Renuva has been helping relieve the symptoms of both men and women that come during the transitional stages of life. Specifically for women, Renuva helps to increase energy, decrease wrinkles, thicken hair, strengthen nails, increase libido, and reduce night sweats and hot flashes. Because many have tried and found success while using this particular product, let us take a closer look at its mechanics. According to researched information, one scoop of Renuva powder should be mixed with 4-8 oz. of cold water every morning within an hour of getting up or before exercising. It is recommended that this should be taken on an empty stomach and users should not eat or drink anything 15 minutes after consuming a dosage. Users should also follow a 5 days on 2 days off routine on a weekly basis. Renuva can be purchased in three different packages. The first package is a one month supply for $59.95. A second 3 month package can be purchased for $119.90. Finally, a third package, a sixth month supply, can be purchased for $199.95. These rates only apply to new customers and customers who have not ordered in over 12 months. With each purchase of Renuva, customers will receive a 30-day 100% money back guarantee. This is a solid guarantee as Renuva states that most customers begin to see results within just a few days. Although it seems that Renuva could provide the relief women desire, there is an element discovered from research which is a great downside to this product. This element is the rather restricting dosage. Many women have tight schedules and do not have time to conform to strict supplement consumptions. With Renuva, women will have to make sure they take their medicine an hour after waking up and cannot eat for 15 minutes afterwards; this may be impossible on many occasions when other deadlines must be met. Another downside to this dosage is the 2 days off 5 days on element. Having to remember which days to take a supplement is an added headache most women do not desire to add to their lifestyle. 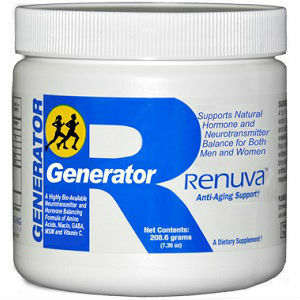 Jackie Horowitz	reviewed Renuva Generator	on March 28th	 and gave it a rating of 2.